Question: What do you get when you combine serendipity with hard work and dedication? Answer: A booming small business that made $1.4 million in its first year and has been growing strong ever since, for 19 amazing years. 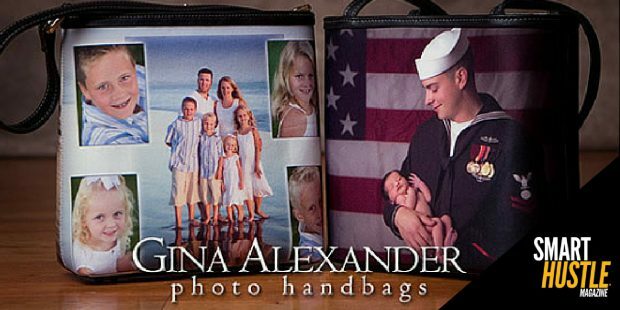 More specifically, I’m referring to my latest interview guest, Gina Alexander, an LA-based designer who has created a line of photo handbags and accessories that are beloved by celebrities and us ‘regular’ folks alike. In my recent chat with Gina, we discussed the humble beginnings of her small business and advice for other business owners. Gina had just been let go from her dream job, and she and her husband were trying to have a baby but found out they couldn’t. They decided to adopt but needed $20K for the adoption. Gina’s solution: how about opening a store? Friends and family loaned her money to get a small kiosk at the Hollywood & Highland retail center. When they finished rehearsal, celebrities came out and were fascinated by Gina’s photo handbags. They even made a bag with Elizabeth Taylor’s dog Sugar on it.
.@Ginaalexander shares how making #mistakes helped her #smallbiz grow. Of course in Hollywood when a celebrity is carrying your product organically, everyone wants it. She was approached by buyers from Nordstrom and Saks saying, “People have been asking for your bags, and we’ve never heard of you!” They asked her to produce bags for 45 stores and agreed to pay her upfront since they would be custom orders. Gina has made many business mistakes in her journey, but these are learning experiences that can help your startup too. For example, she says it’s important to have mentors, but after receiving so much bad advice along the way, she advises small business owners to find a mentor that is in the same business as theirs and who has a good track record and reputation. She also once made a $20K mistake during the holiday season, which taught her the value of communication and urgency when dealing with suppliers and contractors. Overall, Gina says small business owners should not be so hard on themselves. When mistakes happen, take the time to learn the lesson, then forgive yourself and move on. As for her own beginnings, Gina says, “It was like serendipity for us.” But while luck may give you a foot in the door, it takes hard work and dedication to maintain that success. Gina urges other small business owners to develop the right mindset right from the start. There will be resistance and challenges along the way, so make sure to mentally prepare for your smart hustle.